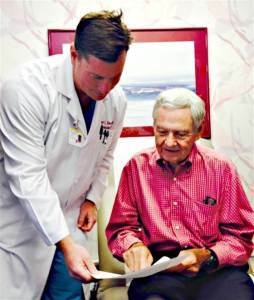 Dr. Robert Kincade (left) shows Dr. Jim Affleck his birth certificate. A Sacramento, California obstetrician is getting a late thank you from a baby he delivered 45 years ago. The Sacramento Bee reports that Robert Kincade performed heart surgery on the now-83-year-old obstetrician, Jim Affleck, last month at Sutter Memorial Hospital. Affleck delivered Kincade, but their connection would have gone unnoticed had it not been for some sleuthing on Kincade’s part. During a meeting before the September surgery, Kincade mentioned to Affleck he had been born at Sutter. Affleck said he had delivered babies there. So Kincade went home and dug up his birth certificate, and sure enough, it was signed by Affleck. Affleck says his delivery of Kincade has come full circle. He feels like a new person after the surgery. “Since its discovery in 1976, Ebola has become the T. Rex of microbes,” says the Stamford, Connecticut-based maker of the “uniquely contagious toy” on its website, which promotes them as gag gifts that also have educational value. Giantmicrobes lists the World Health Organization as one of its largest customers, along with pharmaceutical companies and the American Red Cross. 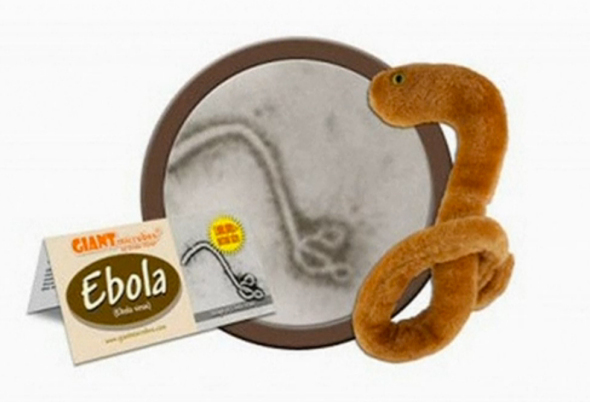 Anyone disappointed by the current shortage of the Ebola toys can click on “Add to Wishlist” and wait for more stock to arrive. Or make a different selection from the company’s array of other plush toys, including Anthrax, Botulism, Cholera and Dengue Fever. It was not clear how many of the toys have been sold and the company could not be reached for comment. (Reuters) – A Washington state high school teacher has been warned not to have students spin a disciplinary “Wheel of Misfortune” to assign punishments for misbehavior that included being pelted with rubber balls by fellow students, school officials said. The Stevenson High School science teacher used the wheel to punish “low-level misconduct” instead of sending the students to lunch-time detention, Superintendent Dan Read wrote in a letter to parents. Results from a third-party investigation showed the teacher’s spinning punishment prop to be “inappropriate, but well-intentioned” and that the teacher did not “desire to embarrass, intimidate or harm any student,” Read said. “Poor judgment by any teacher is concerning and we plan to work with the teacher on more positive and productive classroom management skills going forward,” he added. The school, in Skamania County near the Washington-Oregon border, did not immediately respond to a request for comment, nor did the teacher. A high school employee reached by phone on Friday afternoon said she was back in the classroom. From London’s Daily Telegraph and Reuters.